Heat oven to 350 degrees and lightly dust a 12” round section of your counter with a bit of rice flour. Put first seven ingredients in food processor and pulse to combine well. Spread butter evenly over dry ingredients and pulse until mixture looks similar to cornmeal, about 12 pulses. Add milk and pulse until the dough starts to come together. TIP: If you’re adding cheese or some other additive, add it with or just after the milk. 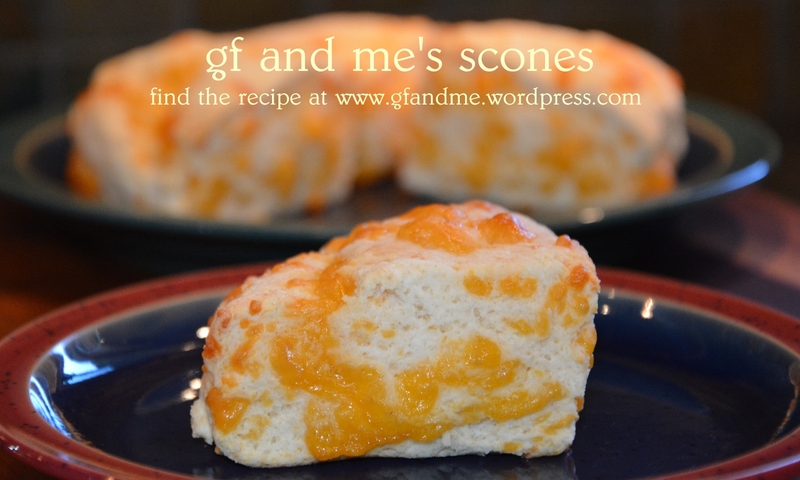 The scones in the photo include ½ cup of shredded medium cheddar. Remove dough from processor and lightly knead on floured counter until it forms a rough ball. It will be very sticky and a bit fluffy. Shape ball into a disk approximately 5 inches in diameter. This entry was posted in Baking, Breakfast & Brunch, Recipes and tagged bread, food processor, gluten free. Bookmark the permalink. Your very welcome. GF baking is definitely involves a learning curve but once you get the hang of it it’s not that bad – except for the cost! Delicious! I’m always looking for a good gf scone recipe. Thanks for sharing! These look so easy to make! Do you prefer them with cheese or raisins? They are both very different. Cheese is great when you want savory but raisin is awesome when you want a sweet treat! I will have to give these a try! Thanks for sharing! They look so light and delicious. Has to be the corn flour and tapioca starch. Yummmmm. Thanks! Yes the corn starch and tapioca flour definitely make them lighter! Trying this one too!! Yippee!! These are really good, as is the crusty bread you liked. Two of our favorites!